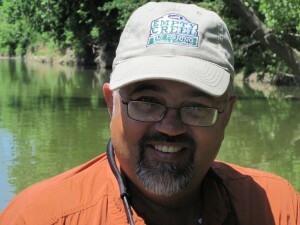 We spent this week fly fishing on one of the jewels of Arkansas, CrookedCreek, with an Arkansas original, Duane Hada. Bo and Duane have been friends for many years an it is Duane that introduced Bo to fly fishing many years ago. 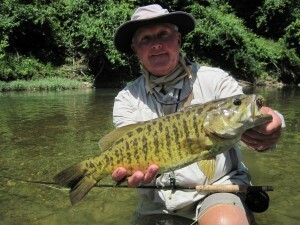 Duane grew up fly fishing the rivers and streams of north central Arkansas and is without a doubt the states premier guide and expert on Smallmouth Bass fishing. He is also a truly accomplished artist and you should definitely visit his Rivertown Art Gallery in downtown Mountain Home, Arkansas. 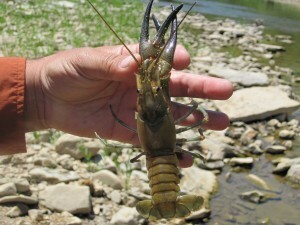 Check out the Long Pinchered Crawfish in the photo. You sure don’t want him to grab your finger. That monster is big enough to eat and is one reason Crooked Creek produces such big, strong Smallmouth Bass. The fish in the photo below is a real trophy Smallmouth and is probably over fifteen years old! It takes a long time for Smallies to grow to this size and that is why Crooked Creek is so special and certainly deserves everyones respect and protection. We had a wonderful week fly fishing with and old friend on a really special stream. Life is good on Crooked Creek. Bo and I hope you will join us or some fly fishing on one our beautiful rivers, streams or lakes and get hooked up to one of the many varieties of fish like these Crooked Creek Smallmouth Bass.